There can be such varying levels of quality, service and expertise amongst the solar companies on the market these days. You can easily be tricked into choosing a company that offers cheaper systems without realising the solar components are of low quality, or their warranties are worthless. On some occasions, companies may use dodgy tactics to keep the price lower on their quotes or make misleading statements to make their offer seem more attractive. With so many options out there, its difficult to know if you’re making the right choice. 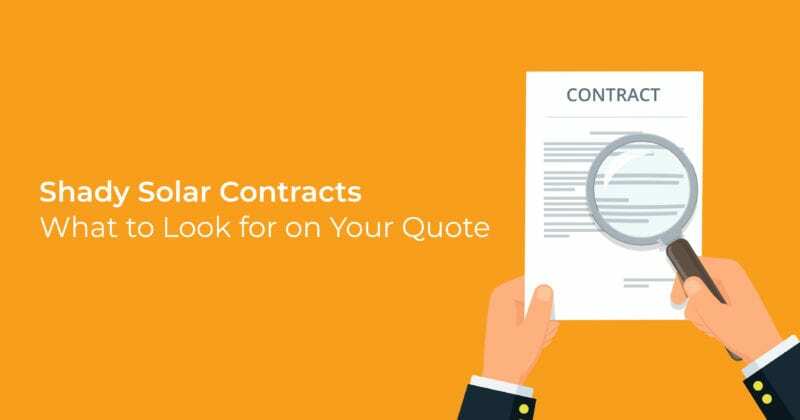 We’ve devised a list of things to look for on your quote to ensure you aren’t about to enter a dodgy contract. To avoid paying the full GST to the ATO, some companies may avoid listing the STC certificates on a quote. The STCs artificially bring the out of pocket price of a system down, but the goods still hold the same value. For example, you could be provided with a quote with a system valued at $6500, but only quoted a price of $3000. Companies do this so they only have to pay the GST on the $3000 price, rather than the full value. This is not allowed and breaches the ATO code of conduct. If you cannot see the STC’s listed on your quote, be sure to ask your sales consultant why it’s not on there, and for them to include this in the official quote. Simply receiving an email with a few dot points listing what package a solar company can offer you does not substantiate an official quote. When requesting a quote, you should always receive an official Quote Document, that clearly outlines each element of the offer. Your quote document should also include terms and conditions. Although it can be a pain to read lengthy T&C’s, it could prevent you from entering into a dodgy contract. Some companies have been known to offer the customer good quality components in their initial offer, only to state in their terms and conditions that they reserve the right to swap the components if need be, providing them with lower-quality equivalents. Stating that your company is the #1 in Australia without having factual data to support this claim is considered highly misleading. SunWiz is an industry intelligence consultancy group that provides data and analysis about solar companies in Australia. You can contact SunWiz if you would like confirmation about the status rank of a company. HINT: "#1 in Australia" may be for customer service, total number of systems installed, quality or anything else, so always dig a little deeper if you are taking a statement like this into account when making a decision. Some other common misleading statements can include promising “no more electricity bills” or “this system will save you thousands of dollars”. While they are of course appealing, these statements are incredibly vague (e.g. thousands of dollars over what period of time?) and hold little accountability. A company should be able to tell you exactly how much they anticipate you will save based on your current usage, without making generalised claims. In an attempt to make a system seem like a better bargain than it is, some companies may advertise the inverter size rather than the output of the system. Not only is this misleading and against the guidelines of the CEC, but it’s also not going to deliver any more power than what your panels can produce. For example, a 4kW inverter does not equal a 4kW size system if you only have 3kW worth of panels on the roof. Your solar quote (or part of your consult discussion) should include a section that states yield estimates relating to shading loss. Unless your roof has absolutely no shading surrounding it, then an expected efficiency loss should be included. At Infinite Energy, we provide this to our customers with their post-install pack, and are happy to supply this information prior on request. Always ask for warranty details in writing. Solar components each have varying warranties that are reflective of their expected lifetime. A solar panel should have a product and performance warranty of 10 years minimum, with most decent brands offering significantly higher than this. The inverter warranty should be 5 years minimum. It’s important to check that the company hasn’t listed any clauses that states they don’t take responsibility for damage caused by installers. The industry standard for a deposit is 10%. While it’s not necessarily wrong, asking for a very high deposit is not usually the action of a company who is financially stable. A general rule of thumb when purchasing solar is if it sounds too good to be true, it probably is. If you find that your solar quote is missing some of the above items, we recommend you ask your solar consultant why it isn’t listed. If they can’t provide a suitable answer, it’s probably best to walk away. For more information on how to background check a solar company, you can check out this blog post. If you’d like to discuss your solar options with us, we’d be happy to provide you with a quote. We pride ourselves on our non-pushy, consultative and informative approach, giving our customers peace of mind when it comes to working with us. If you’d like to request a free quote, contact us today.